With an average of 287 Days of Sunshine, outdoor actives abound throughout Alamogordo and all of Otero County. Located in the high desert at the base of the Sacramento Mountains, Alamogordo is the perfect location to “set up camp” to enjoy all the incredible attractions the area has to offer. Only 15 minutes from Alamogordo, one of the world's great natural wonders rises from the desert, White Sands National Monument. The glistening white sands and wave like dunes of white gypsum cover 275 square miles of the desert and are an incredible sight to see. Just past Holloman Air Force Base, on highway 70 west, start your White Sands tour at the Spanish Pueblo adobe architecture visitors center, constructed on site between 1936 and 1939. Then enjoy the hiking, biking, camping, picnicking and sledding or the picturesque sunset strolls and full moon night events at this breathtaking location. Not far from the world’s largest gypsum dune field is the world’s largest pistachio! The Tularosa Basin has the perfect climate for growing pistachios, pecans and grapes. There are numerous wineries and nut farms where you can enjoy delicious wine and nut tastings and beautiful views of the Sacramento Mountains. 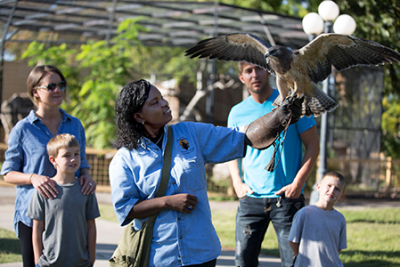 If you would like to commune with nature even more, stop by the oldest zoo in the southwest, Alameda Park Zoo. Also, there are over 100 maintain trails that range in use from hiking, pack/saddle, mountain biking, motorcycle and ATV riding. In the winter months two of the southernmost ski resorts in the US are less than an hour away. And because of our beautiful weather, golf is a year-round sport at Desert Lakes Golf Course and many other courses a short distance from Alamogordo. Finally, when you need a break from the great outdoors, take in a show at the Flickinger Center for Preforming Arts, shop in our Alamogordo MainStreet district or spend an afternoon in one of our beautiful museums, such as the New Mexico Museum of Space History or the Tularosa Basin Museum of History. Whether it is the great weather and wide-open spaces, or the history and amazing people of this area, Alamogordo is a great place to visit, live or start a business; we hope you come join us soon. Top 5 Reasons to Visit Alamogordo! The Audrey L. Dunn Sr. Visitor Center is a great place to find information about our local and regional area. Visitor Center volunteers love to Share their passion and knowledge about Alamogordo and all the great things to do. Come by to chat, pick-up some info or take a picture in front of the new "Greetings from Alamogordo" mural. Watch the City of Alamogordo's, Best of New Mexico. Visit the Desert Lakes Golf Course website. Find information about the Alameda Park Zoo. Access links about tourism in Alamogordo. Alamogordo MainStreet is a non-profit organization, and is a member community of the New Mexico MainStreet. They work to increase economic development in the MainStreet District. Find Vacation Fun's online guide to visiting Alamogordo.